Wow... I knew that the FIC AU11 would be a good performer, but I didn't know it would be that good! As you can clearly see by the benchmarks we've shown you, the FIC AU11 is not just an extremely fast motherboard, it's also a good overclocker as well! Perhaps FIC will try their hands at catering towards the "extremists". = ) To top things off, with a retail price of $195 CDN ($115 US) the AU11 is one of the most affordable nForce2 boards out there at the moment. As we saw with the MSI K7N2-L and now the FIC AU11, nVIDIA's nForce2 is clearly the fastest AMD chipset on the market. Stability was not a problem during testing, the AU11 was 100% rock stable and did not give us any problems. The AU11 does have a fair number of on board features such as 5.1 audio, USB2.0, 10/100 LAN and IEEE 1394. If that's not enough for you never fear; with six PCI slots you shouldn't have any problems expanding the motherboard. The FIC AU11 Chameleon is a very fast, and in our testing a very stable motherboard with a load of good features. If you need more it is expandable as well. It's nice to see FIC include so many powerful options in the BIOS, it looks like they may be trying to target the overclocker a bit now as well. If you're looking for a fast nForce2 motherboard, you're definitely going to want to take a look at the FIC AU11! Almost exactly two years after PCstats initially tested this FIC AU11 Socket A motherboard, we are withdrawing our "Recommended Product Award" because of concern over faulty low-ESR capacitors bursting. This defect causes total motherboard failure. 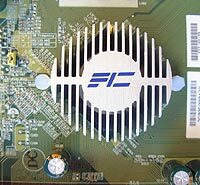 While the FIC AU11 motherboard proved to have many admirable qualities for its time in the initial test report and benchmarks, the long-term reliability of this model has been called into question due to bursting capacitors. The issue of burst capacitors is a difficult one to foresee, and not specific to any one manufacturer. The problem can take years to develop, and may or may not affect all boards of a particular model. In the case of the FIC AU11, the GSC T2NB (10v 2200microfarad) and half the GSC T2NC (6.3v 1000microfarad) low-ESR aluminum capacitors failed, due to bursting.